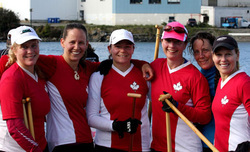 The Comox Valley Canoe Racing Club is focused on competitive outrigger paddling. We do not have a recreational component to our club, however, you don't need to be an elite athlete to join. Access to the club OC6 outriggers (currently three boats), boat safety gear, two older OC1 outriggers, and all scheduled practice times is included in your membership dues. You will be responsible to provide your paddle and personal safety gear. If you would like to give it a try, contact us to arrange joining one of our training paddles. Though we paddle year round ( including the occasional crisp day in December & January), the outrigger competition season runs steady from February through November. Download and print out the membership and waiver form. Fill out the forms and sign the waiver. Note: if you are under 19 years of age then a signature of a parent or legal guardian is needed. Bring the form with a cheque (payable to "Comox Valley Canoe Racing Club") to one of our training sessions at the compound. Review the club safety and manual information.